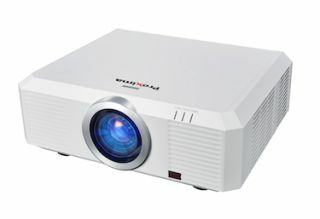 The What: Proxima Displays has released the M1030U high resolution WUXGA projector. The M1030U is the third product in the M1000 series from Proxima. The What Else: The M1030U features a brightness level of 5,000 lumens, and WUXGA 1920x1200 resolution on LCD panels. It also includes full I/O connectivity including VGA, HDMI, BNC, DVI, and RJ45 inputs. The M1030 ships with the standard lens, and offers four additional lens options, from rear projection through tele-photo lens capability. The Bottom Line: The M1030U, as well as the other M1000 series products are Crestron RoomView, AMX, and Extron certified and tested. This projector is ideal for higher education, house of worship, and rental and staging environments.